Today marks the start of The Holy Month of Ramadan; it means many conflicting things to me, as a long-term resident in the Middle East and a non-Muslim. Writing this on holiday in the UK, it will have very little impact this year, but it’s become part of my life during my eighteen years in the region. My early experience in Jeddah, Saudi Arabia tainted my view. Travelling anywhere in the evenings meant facing huge traffic jams. Advertising and promotion of food and gifts went overboard. It seemed that the whole city was bent of a month of massive consumption, a bit like Christmas in the West but for longer. As we lived a life apart in compounds and didn’t visit the homes of ordinary Saudis; this is only one outsider view, but combined with anecdotes from the workplace of their colleagues sleeping during the day, doing no work and grumbling about how weak they were from lack of food it wasn’t an edifying introduction. It took a move to Dubai to bring me closer to understanding this Holy Month. A good friend described the ritual of prayer and breaking her fast every evening with a date and some water. I passed mosques providing evening meals where rows of men sat together eating together from large plates of rice and meat. The prayers ringing out across the city which are a backdrop to our lives here sounded more poignant. I started to learn about the differences between Iftar and Suhoor (including this wonderful account by Holly) and importance of being with family to share them. For many people this is an intense period of contemplation bringing them closer to God. I’ve felt the palpable excitement around the sighting of the moon and firing of the canon in Safa Park to announce the beginning of Ramadan and the joyous feeling of celebration at the end of the month. There’s still a feeling of apartness – Emiratis make up less than 20 per cent of the population – but Dubai winds down for a month evocative of its past as a sleepy trading post on the creek instead of the frenetic city it has become. The closest I’ve got to breaking the fast with locals is via this excellent article by Anissa Helou. There are contradictions here in Dubai too. KP doesn’t eat while he’s out of the house as a matter of respect to those who are fasting and I try to do the same. One time I cleared some freight through a large company staffed completely by Asian Christians and was amazed to see everyone eating and drinking with abandon, while a tea trolley did the rounds of the offices; it was like stepping into another, rather jolly, world. Coffee shops shut down during the day or special curtains are erected to screen them from accidental view giving the feeling of entering a speak-easy during prohibition. I’ve noticed that as tourism has grown over the years, people are less aware or sympathetic to local sensitivities and see many picnics on my local beach during the day. 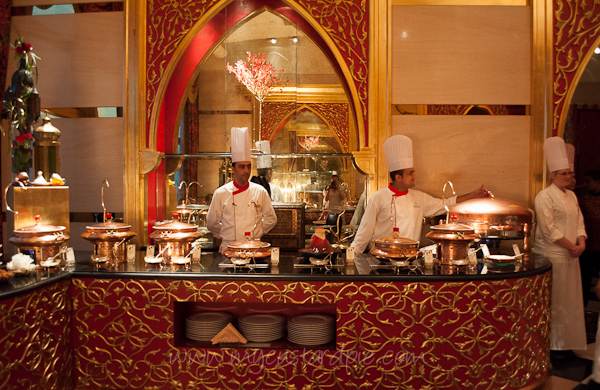 Choices for where to eat Iftar, or the traditional evening meal, are myriad in a city with well over 5000 restaurants. Many places feature Ramadan tents where diners can relax outside on cushions, often smoking sheesha. Before Ramadan this year, I was invited to a preview of the Iftar spread at the legendary Burj Al Arab, the sail-shaped hotel which has become a visual icon of Dubai. The clean lines outside belie a riot of Arabian colour inside where the Al Iwan restaurant is central. Cooling fresh fruit juices were served on arrival, a group of Arabic musicians played traditional music and the central area was lined with little bowls or gleaming copper chafing dishes. A display of dates, fruit, dessert and Arabic sweets formed a jewelled centrepiece. The buffet included all the things you might expect including creamy hummous, mutabal and muhammara, lemon-sharp fattoush, taboulleh and vine leaves plus Western style appetisers such as piles of prawns, oysters on ice. The chafing dishes revealed stews and tagines including a traditional Emirati dish called chicken harees – made with wheat and porridge-like in texture. A chef proudly displayed an enormous fish, called hallwya, with charmoula (a thick herb paste) cooked over hot coals while another carved a whole baby lamb (ouzi) which flaked from the bone served with saffron rice. Hot desserts included my favourite milk pudding Um Ali (mother of Ali) and from the dessert display tiny maamoul heavily scented with orange blossom. I took my time, taking small tastes and going back to try more, sipping laban and mint lemonade. Coffee spiced with cardamon served in tiny cups ended this Arabian experience and I stepped out into the warm night air to the best view of the Jumeirah coastline, lights glittering, the hotel’s shooting display of water and flame punctuating the calm evening. How will you be spending Ramadan? What are your impressions of the Holy Month? Do you have any favourite dishes, rituals or family traditions? And what happens to all that food (I’d love to hear from anyone in Dubai who knows)? My inbox has been inundated with emails about the hundreds of offers available so here are just a handful. Do check out The Hedonista for more recommendations and a guide to eating and drinking etiquette too. 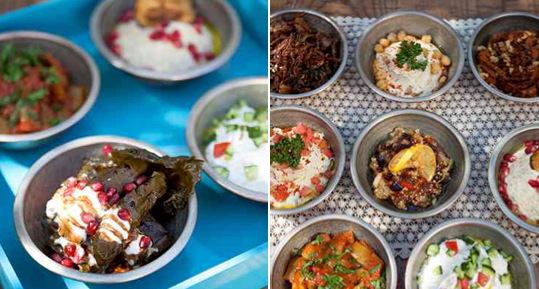 Zaroob, the traditional Arabic street food specialist has an Iftar buffet for a reasonable 69 AED and includes 3 cold and 3 hot starters, 3 Plat Du Jour, 3 Ramadan drinks and 3 deserts all served with elements of the Levant region. Open from 7pm to sunset every day during Ramadan (located on Sheikh Zayed Road, Jumeirah Tower Building) Tel: +971 4 327606 Also worth a look at Mezza House. Also worth a mention is the buffet experience at the H Hotel created by Silvena Rowe (‘a feast fit for an Ottoman king’) on Lime and Tonic: an ‘Iftar treasure chest’ home delivery on the site too. 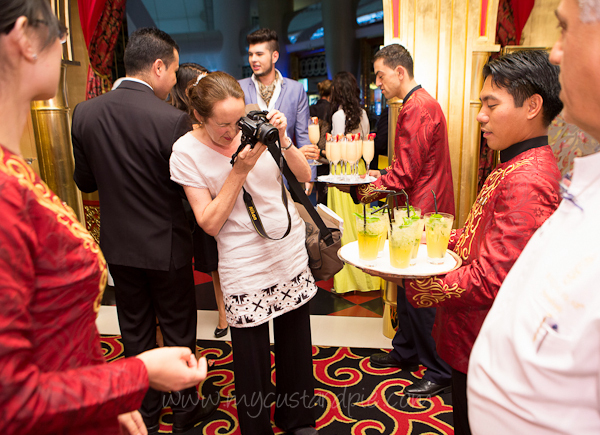 Thanks to the Burj al Arab for sending this picture of me (wearing very creased linen) in action! – also for inviting me to their Iftar preview event. Would really love your feedback on this. A reminder….How will you be spending Ramadan? What are your impressions of the Holy Month? Do you have any favourite dishes, rituals or family traditions? And what happens to all that food (I’d love to hear from anyone in Dubai who knows)? Ramadan Kareem to all who are observing the Holy Month. Very thought provoking Sally. For me Ramadan, Eid, Diwali, Hannukah, Christmas are all the same – joyous times to cherish the patchwork of cultures we are blessed to have. My grandfather in Rajkot had a ‘muselman’ friend and a catholic friend and I remember sitting watching the three get all wound up and animated over so many conversations at the age of eight. Never a clue what they were talking about but keep the memory close to remind me to stay respectful but true to my own beliefs. How lucky you are to have been brought up with such an open minded view – wouldn’t the world look different if this was widespread. Thank you for this beautifully written comment Urvashi. Thank you for adding this comment Dave – all that food waste worries me a lot. Lovely post as always. Interesting that the ambience of Ramadan is so plastic in Saudi. I must say I do get a bit of that here, but its solely due to businesses grabbing every chance for a promotion they can. Although I do love all the sweets tents erected in hypermarkets, and the displays of Ramadan Lanterns for sale. I knew Zaroob would have a decent Iftar option – thanks for finding it and sharing. All those links have given me some reading to do! Off to visit Holly now. Thanks for your thoughtful comment. Your post on Ramadan is another authoritative and useful guide in so many ways. We were on the same wavelength with the Abu Dhabi mosque! Interesting reading Sally with such lovely pictures. The contradictions, the differences in the way traditions are observed in different places and yes, the over-the-top but stunning buffet at the Burj… you’ve pointed out so many interesting things. Yes, ‘where does the food go’? I’ve been asking that to most hotels – the municipality doesn’t permit any leftovers to be given away and some hotels don’t even parcel a diner’s left overs. I read an article yesterday in Gulf News – Dubai Municipality will allow the excess from hotels to be given away during Ramadan but I’m not sure whether that pertains to ‘cooked food’ as well. While most observing the fast, break their fast at home and don’t go to these restaurant buffets. They might join the Suhour though. Thanks Ishita – I must look for that Gulf News article. Rice pudding was a staple when I grew up – hopefully I’ll get to taste ‘firni’ some day. Shopping trolley snooping – that’s what I do too! It’s actually very sunny and hot here in the UK – not on a Dubai level though. Oh, I dream of feasting on Ramadan food! Absolutely mouthwatering. Your comment makes me realise it’s something I’ve got used to. Yes, a generous Ramadan spread is a wonderful thing indeed. I can’t imagine the challenges of trying to fast, remaining in Dubai during summer and staying fit and active Holly. I love the sound of your home-cooked iftars though. Good point. It’s a very spiritual month with zagat (charitable works and donations) forming a very important part. Great Post Sally – really took me back! I have two good friends here who are Muslim – I really feel for them, it is light here in Holland at the moment from about 5am till 11pm, a long fast…..
Gosh yes – similar here in the UK. Must give a thought to all those fasting with long daylight hours. Wow! That’s a great insight into Ramadan. Love the post and your blog! I have moved recently to Dubai from London and can so connect to you. Pleased to have found your blog! Best wishes! Thanks Torie – appreciate you taking the time to comment. Wonderful account Sally! have been in a variety of countries during Ramadan over the years: Zanzibar, Egypt, Turkey and in the Emirates and have always attempted to respect the traditions and have thoroughly enjoyed the special food this celebration brings along! Thanks Karin – you reminded me of visiting Malaysia during Ramadan which that year coincided with Chinese New Year. Both occasions were celebrated side by side. Thank you for such a thoughtful comment. The simplicity of life and helping others is something we all need to remember. Thank you Sally. Such an interesting and though provoking post. Living near the southernmost tip of the Northern line Ramadan touches us in a different way. Morden has a very large mosque (in a converted Express dairy building). Last year popping in to buy a shawarma on the way back from a child’s athletics training coincided with the breaking of fast. I am very obviously non Muslim but was offered water and dates before my shawarma was made. Time was taken to explain the ritual to my teens who were pleased to be included. A small act made an important memory. Sally what a wonderfully evocative blog, and thank you for the links and your thoughtful understanding of this culture. Great post, Sally! And thanks for the enticing line up of Iftar suggestions. I remember my first Ramadan well. We were living in Abu Dhabi, 25 years ago, and I was working at a small advertising and publishing agency. Back then, most companies kept the hours of 9 a.m. – 1 p.m. and 4 – 7 p.m. During Ramadan, we were closed for the afternoon so it was a very short day. I’d rush home to pack up the cooler with drinks and food and we’d sail our little catamaran out to a secluded, deserted island to picnic where it was safe not to offend anyone. Since then, I have been blessed to break fast with Muslims friends in a few other countries. It is always an honor to be included. Such an interesting post Sally, I’m feeling very ignorant but intrigued by Iftar. Really like the way that you respect the beliefs of those who are fasting. And the feasting sounds wonderful. It’s been a few years since I visited Dubai, but I did manage a 3 day stop-over in Abu Dhabi, on the way to Australia, a couple of years ago. 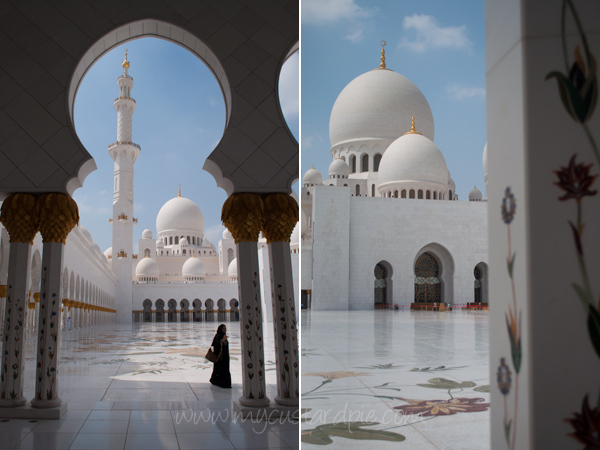 I found the Sheikh Zayed Grand Mosque absolutely fascinating, so I was delighted to see your first photograph. I hadn’t given much consideration to the actions of others during Ramadan, but it seems to me that people should be much more respectful whilst in the country of others, either as a temporary or more permanent resident. As you probably know, Spain is a deeply religious country, with every opportunity for a Catholic saint’s day being celebrated with carrying of huge statues through the streets. I don’t share their devotion, but as an expat am always fascinated and respectful of my neighbour’s traditions. Very interesting post and fascinating insight. Thank you. I have hundreds of pics of that mosque – mainly unpublished as I can’t decide which ones are best. It is truly mesmerising. Love your take on tolerance – quite agree…and interesting to get a snap shot of Spain. Excellent article! One correction- The Emirati Dish is called Chicken Harees not Barees as mentioned. The lamb version is the most preferred and authentic one. Thanks for pointing this out – I’m sure it was down to some auto-correct function which I didn’t notice so thanks for spotting. Good to know about the lamb being most popular too. Really appreciate your comment. Most welcome – you have the definitive Ramadan series.